Salient Features of Book Provides insight into what drives the recruitment process and what an interviewer looks for while interviewing an engineering student. Covers concepts, problems and interview questions for each topic. Covers latest buzzwords like cloud computing, vitalization, big data and many more. All the concepts are discussed in a lucid, easy to understand manner. A reader without any basic knowledge in computers can comfortably follow this book. Coders / Programmers are in demand, but to land the job, you must demonstrate knowledge of those things expected by today’s employers. This guide sets you up for success. Not only does it provide the most commonly asked interview questions and answers, but it also offers insight into the interview process in today’s marketplace. This book is a comprehensive guide for experienced and first-time programmers alike. The book is specifically designed for freshers, who despite being brilliant at the technical aspects of the interview, tend to fail when it comes to soft skills and HR interviews. The book provides readers with a relevant blueprint when it comes to planning for pre-interview preparation. It provides candidates with guidelines on the preparation of their resumes and the format that should be followed. About the Author Narasimha Karumanchi is the founder of CareerMonk and author of few books on data structures, algorithms and design patterns. He was a software developer who has been both interviewer and interviewee over his long career. Most recently he worked for Amazon Corporation, IBM labs, Mentor Graphics and Microsoft. He filed patents which are under processing. He authored the following books which got translated to international languages – Chinese, Japanese, Korea and Taiwan. Also, around 58 international universities were using these books as reference for academic courses. Elements of computer networking Data structures and algorithms made easy Data structures and algorithms made easy in Java Data structures and algorithms made easy for GATE Peeling design patterns IT Interview questions Coding interview questions Narasimha held M.Tech. in computer science from IIT, Bombay, after finishing his B.Tech. from JNT university. He has also taught data structures and algorithms at various training institutes and colleges. 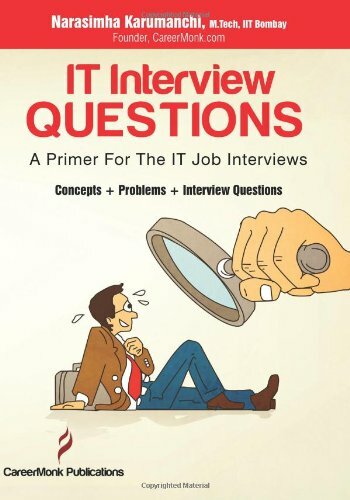 Buy the book It Interview Questions: A Primer for the It Job Interviews (Concepts, Problems and Interview Questions) from Ideakart.com.